While I’m still not sold on The Predator, If you happen to be a fan and own the earlier movies in the franchise then you will want to add this film to your collection. The extras are enjoyable and the audio and video quality are some of the best around. Being a fan of the Predator series I was excited when a new one was announced and was released in theaters this fall. However, The Predator just didn't live up to my expectations. The problem is I can't exactly pinpoint exactly why. The movie wasn't bad - I was entertained but for some reason, I just didn't like it. The cast that included Boyd Holbrook (Logan), Olivia Munn (X-Men: Apocalypse), Thomas Jane (Punisher) Keegan-Michael Key (The Dark Crystal: Age of Resistance) and Sterling K. Brown (This Is Us) was great but I can honestly say I am not itching to see them in a follow-up. To be truthful, I accepted this assignment for the 4K UHD review because I wanted to make sure I just wasn't in a bad mood when I saw it in the theater. Nope, nothing changed for me after watching it again. Still a good cast, and some strong graphics but I didn't connect with the movie as much as I hoped I would. There was a plot that flowed throughout the movie and made sense. There was plenty of action to get the blood pumping. Plenty of one-liners for us to quote after the movie. It was just missing that… I don't know. The best thing the film has going is the element of surprise here. This is the sixth movie in the series and at this point, everybody knows what the Predator is and what we can expect pretty much. We are all along for the ride to see where it takes us. I guess when I learned about Shane Black's involvement with writing the script and directing I thought it would bring back the magic that made the first one the classic it is. Maybe I was too hyped after seeing so many weak Predator movies. Unfortunately, this did not reawaken my love for the franchise. Maybe if Mr. Black wasn't the first to die in Predator (1987) he would have been able to pick up some tricks on finding the heartbeat on this one. Come think of it I think I might have figured it out. A predator dog? Really? Maybe that was the problem. While the feature itself tends to get a bit silly the video and audio of the presentation could not be better. Presented in 2160p with its original 2.39:1 aspect ratio, as a home entertainment reviewer I could not be happier. Blacks are true and colors are vibrant. One glowing issue with 4K is that since the film is usually filmed at a higher pixel rate than the special effects they become much more obvious to see. I could probably count on my hand maybe two to three times the 4K blended seamlessly since the format started. Well, add one to that amount as The Predator 4K is one of the best blendings of film and CGI we have since the format came out. Rounding out the presentation is the Dolby Atmos audio track. Just like with the video 20th Century Fox went all out on the transfer. Sound sees to come from every direction. It is a totally impressive experience and you actually feel like you are there with the cast inside the muck. 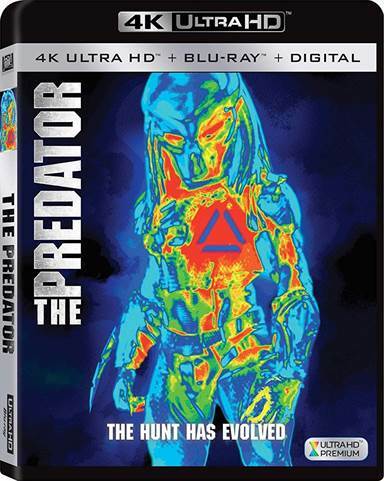 To make sure to deliver the best possible 4K transfer the special features of The Predator are contained on just the Blu-ray and the Digital HD presentation. The special features include deleted scenes, three featurettes, a still gallery, and the theatrical trailers. One great feature of the now standard Digital HD inclusion is the fact that new things can be added later on, and that is exactly what they did with this release. After broadcasting THE PREDATOR Stop-Motion Holiday Special on Comedy Central during BoJack Horseman on December 19th, 2018, they added it a week later to the special features on the Digital HD. While I'm still not sold on this latest film in the series, If you happen to be a fan and own the earlier movies in the franchise then you will want to add this film to your collection. The extras are enjoyable and the audio and video quality are some of the best around. Download The Predator from the iTunes Store in Digial HD. For more information about The Predator visit the FlickDirect Movie Database.